(L to R) Love Me Love My Zimmerframe, Wandering Flob, Zoe and Weta Prowl. From the summit an easy decent is down the South ridge to the col between Steeple Peak and Point 2200, before following scree slopes back to camp. Access to the East face climbs is via either the South Temple valley or North Temple valley and Gun Sight Pass. Under the East face there is a good bivy / camp site on a shelf at the 1450m contour on the true left of the valley with water a few minutes walk away. Alternatively access via North Temple Stream and a col between Bruce and Steeple peaks is much faster. See Bruce Peak for details. From the mid North Temple Stream GR H38, 535752, approach the peak through the beech forest, then ascend across the east face to reach the gully between Steeple Peak and Peak 2200m. Climb the rock (about grade 12) to the summit. Easier access is from the mid South Temple. 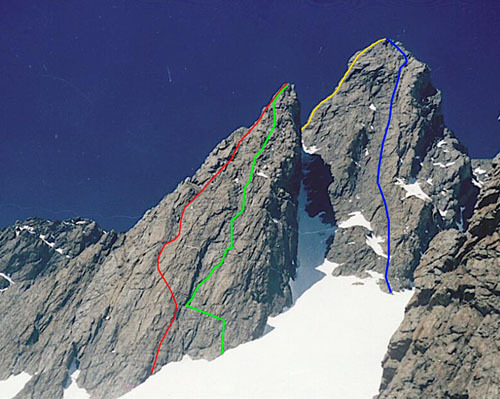 Twelve pitches on northern outlier of Steeple Peak. Begin at the middle of the slab to the right of small pointy knoll near the bottom. Straight up for two pitches through two awkward corner with not much gear, then rising leftwards traverse to avoid the overhangs till near the ledge at half height. From there easier scrambling, grade 12 ish and a small section of grade 14 at the top. Connects with Zoe and Weta Prowl in upper part. Some pitons used for protection. Twelve pitches with cruxes at grade 15. A six pitch route in February, to the right of Love me love my Zimmerframe. grade 13-16, pitches varying from 15-60 m, has fair to good rock quality and protection. Descent was via two 60m abseils. The climb was repeated the next day by Derek Billings and Dave Ryan. On north side of Steeple Peak outlier. Seven pitches left of Weta Prowl. Crux 17, mostly 12-14 climbing on great red greywacke with good protection. On the centre of the shorter right hand, west facing wall. From its low point, scramble up and left for about 60m to a scree shelf. Climb the slab for 6 or more pitches between the two rock flanges at up to grade 14. The last pitch places you on a ridge where a short final pitch gets you over the first and most difficult of the ridges obstacles. The ridge is then followed for about 150m as a difficult scramble to the summit. 300m height gain, plenty of protection on excellent rock. To the R of Weta Prowl, finishing up a flake tucked up against the final steep buttress, to join W Prowl near the top. From the col between Steeple Peak and Point 2200, follow the ridge as an easy scramble on fractured rock to the summit.